It was a real treat to see the Mariinsky at the Royal Opera House on Tuesday night. I’d not been able to get tickets for any of their full-length ballets whilst they’re here, but I do love a good triple bill too. I find it quite useful to record my thoughts about watching ballet – and theatre – as soon as I can, and without any of the research and reading that a traditional reviewer or critic will access during their writing process. So I won’t necessarily read the programme, or research story or performance history for example. On the one hand I find this a pleasurable process, to receive impressions from the performance itself in the first instance, and on the other I think it is quite a useful record of the experience of performance with the minimum of “other stuff” in the way. So seeing all three pieces on Tuesday night for the first time and with extremely minimal prior knowledge was really interesting! Although The Firebird was visually stunning – think the absolute height of turn-of-the-century Ballets Russes stylised glamour – it did present quite a number of problems for me. I think it was danced beautifully, but these issues of presentation did rather distract me from the patent skill of the dancers on stage. I think in many ways it encapsulated a great deal of the problems I find in traditional story ballets in one neat 45-minute package! The ballet is divided into three sections – the Firebird appears to a hunter in a gated demesne, then a princess and her maids appear and she and the hunter fall in love, then for no apparent reason (have they stayed in the garden too long?? not sure) an army of scary monsters appears. The princess seems to be able to combat them by just being too beautiful and pure, but in the end the Firebird vanquishes them. Then some of them seem to turn into handsome courtiers who marry the maidens and the hunter and the princess marry of course too. Don’t know what the Firebird thinks to all this. There’s also been a golden tree that bears golden fruit throughout, for the life of me I don’t know what it signifies, but it does provide opportunity for some messing around with flowers and leaves and apples. So yes, it’s one of those ridiculous ballet stories that you kind of have to accept. What I found problematic was the representation of the Firebird – who as the only character en pointe and in a platter tutu looks HUGE and supernatural and strong – as being caught. Admittedly there is some interesting choreography where she struggles against the hunter and the classical lines of a hold are broken. However the story of the dance seems to be that she’s a beautiful wild thing who struggles against entrapment but then ends up liking it. Similarly the beautiful princess (who’s clad in a lot of white along with her maidens) is extremely shy and retiring until she too is “caught”. It just seemed like two really backwards representations of women – the fiery but tamed woman and the modest virgin. And choreographically the hunter didn’t have a right lot to do – another representational problem for me that seems to obsess over women’s bodies. And you know, the prince/hunter jumping off a stage rock and banging to the floor, the Firebird kind of galumphing across the stage a few times on her own at the beginning, and then when she bites off a bit of the golden tree….I kind of found it unintentionally funny. I sniggered a bit. Ditto for the score at some points – the orchestra winding up for the fireworks on stage, for example. Should I stop being such a snob? The dancer who played the monster king was obviously having a ball staggering about as a scary villain – but I felt like I couldn’t join in the fun. Is this because the ballet has aged badly, maybe? We as an audience don’t find the same pleasure in the spectacle as perhaps the audience of 1901 did? I’m not sure how far this argument can go, as many ballets and other theatrical events are re-presented successfully. However this does bring to the fore arguments about keeping ballets intact, and the value of preserving a historically “authentic” piece. Personally I’m all for re-interpretation and re-presentation. However I wonder if maybe there are audiences who simply revel in the pantomimic fanfare of the piece and love it for what it is – absurdities and all? I was on more solid ground with Marguerite et Armande, as I vaguely knew the story – she’s a consumptive demimondaine, they’re in love etc. 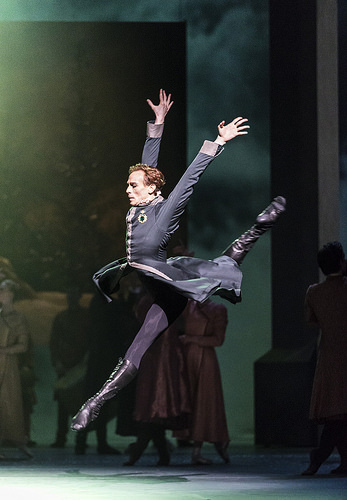 I have to admit I was very excited to see Uliana Lopatkina, and she was just beautiful – I wish I’d been able to see her dance a full-length role. The ballet is such a mid-century British piece – made on Fonteyn and Nureyev by Frederick Ashton, designed by Cecil Beaton – and it did look stunning with its pared-back set and exquisite late-Victorian costume. The acting from Lopatkina and Askerov as Marguerite and Armande was really very good. However the switch from fairytale pantomime to this quite intricate and subtly played out tragedy I found very jarring. This feeling continued with the final piece, Concerto DSCH, a thoroughly modern piece which premiered in 2008. Although choreographed by a Russian, it did feel very American to me, and seemed in many places to pastiche American popular culture – quite unusual when I remembered it was being performed by a Russian company. Again the switch of the quality of attention I need to pay to the different modes of performance felt unsettling. I’ve attended a couple of Royal Ballet triple-bills before, and although the pieces performed were in some ways divergent, nevertheless there did seem to be a through-line that connected up all three. This left me wondering what the rationale might be behind the Mariinsky’s programming decision. On the one hand as a bill in a visiting company’s tour, it might seem to showcase the variety of styles that the Mariinsky can master. However as a well-recognised, world-renowned company, I’m not quite sure that we need this to be proved to us. In another sense the programme seemed to have quite a didactic tone – as if we were being shown ballet through the ages. That’s what I read ballet history for – not what I want out of an evening at the Royal Opera House. I’m sure some audience members will have enjoyed the variety of styles on offer, maybe in a similar manner to a platter of different delicious treats, savouring each flavour. For me however, I felt as though I couldn’t quite get my teeth in to any of them, as they were whipped away and replaced by something new and completely different. A lucky opportunity to see a talented company and an evening full of dazzle, I was far from completely disappointed. But a reminder how the kinds of decisions made beyond the dancing bodies on stage can really impact the audience’s experience at the ballet.